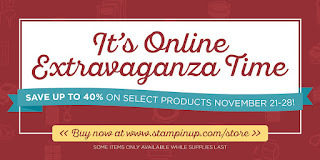 The one week long Stampin' Up! 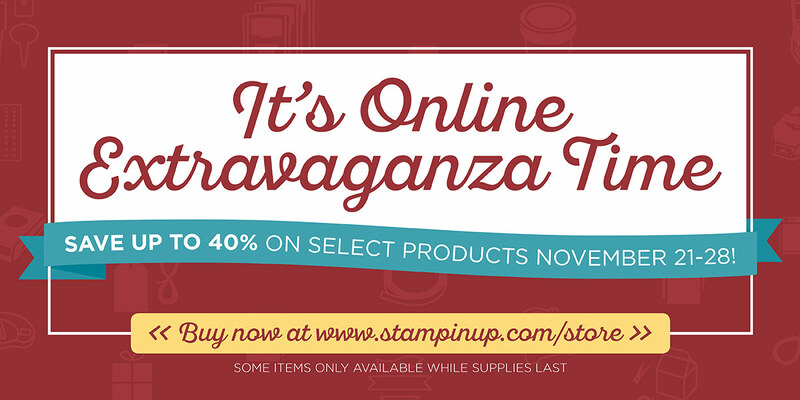 Online Extravaganza Sale begins today! There are incredible deals that you absolutely do NOT want to miss! Click HERE to see everything that's on sale. Download Online Extravaganza Sale 2016 Page Numbers! There are two flash sale days - November 21 and November 28 where bundled product is offered ONLY on those days and ONLY while supplies last. You can add any other product that is available from Nov 21 - 28 to the same order. You can add other items to your Online Extravaganza sale order from the Annual & Occasions catalogue and the Clearance Rack! If your order reaches $200 (before shipping/taxes) you earn Host Rewards! many items are offered WHILE SUPPLIES LAST so make sure you don't miss out and order early! HOW To Order: You can place your order online through my Online Store or by email me (stampinwithmelva@gmail.com).